To identify a king salmon, check for black gums. (Berett Wilber). Next year, biologists are predicting the smallest number ever of Chinook salmon returning to the Chilkat River. Brian Elliott monitors Chinook stock for Fish and Game in Haines. 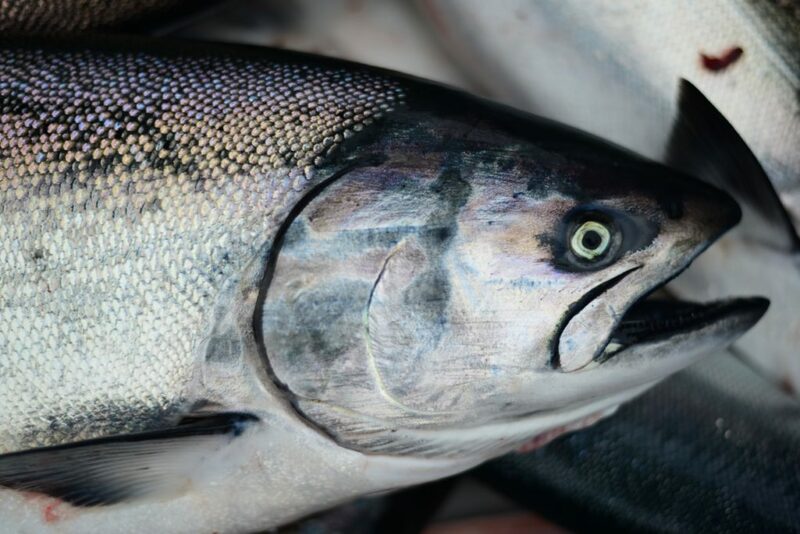 The Department is recommending Chilkat Chinook for a “stock of concern” designation. Kings from the Unuk and King Salmon rivers will also likely get the title — and new management plans that will restrict harvest. Chinook forecasts for 2018, compared to 2017 numbers. Alaska Department of Fish and Game. The Board of Fish is set to approve Chilkat Chinooks as a stock of concern at their January meeting, after years of some of the lowest returns they’ve ever seen. Last year, only 1,173 kings were forecasted to spawn up the River. That’s between one and two-thirds less than managers hoped for. The escapement goal represents the number of fish that need to spawn to guarantee there are enough baby fish for healthy and harvestable runs. And that’s not happening. Next year’s forecast is even worse: just 1033 kings are expected to run up the Chilkat. Elliott worries that if those numbers keep dipping, Southeast king salmon won’t stop dwindling even if fishing is completely restricted. “Despite restrictive actions in all our fisheries — we’ve really pulled back the reins on harvest — we’re still not making our escapement goals,” Elliott said. Ed Jones agreed. He’s Fish and Game’s Chinook Research Initiative Coordinator. He says baby king salmon are suffering from marine mortality. Managers can’t jump in the water and guard fish: they can only adjust the behavior of people. Giving Chinooks “stock of concern” status will give the Department new guidelines to enforce who can fish when. 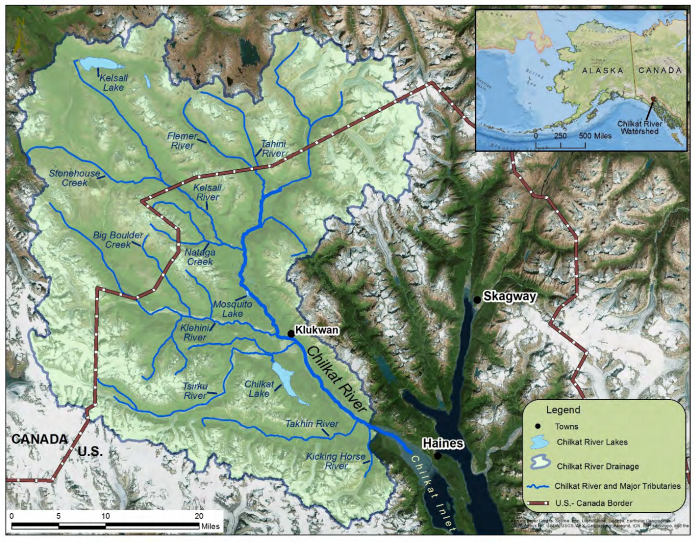 Chinook spawning grounds on the Chilkat River from the Alaska Department of Fish and Game. ADF&G’s draft action plan includes a scale of lenient to stringent restrictions for each fishery that’s likely to see kings from the Chilkat, Unuk or King Salmon River. Options include restrictions by gear — such as limiting mesh sizes for gillnetters — to closing fishing areas, postponing or shortening seasons, and ratcheting down bag limits. The Board of Fish will choose which level of restriction to run with for each fishery — commercial, sport and subsistence. They can mix, match, add or reject elements of the draft plan, meaning new rules for catching Southeast Chinook won’t be final until the meeting is over. The board will take public comment as part of their deliberation. Last year, sport, commercial, and subsistence fisheries all operated on restrictions, until the Department embargoed catching kings in late August. Elliott said fishermen should expect more restrictions in 2018. Jones echoed those concerns. He said while it’s typical to see salmon cycle through better and worse runs, these numbers are not normal. Or at least, they didn’t use to be. The Board of Fish will meet January 11 – 23 in Sitka.